Joy Creek Photo Archive (c) all rights reserved (We mistakenly sold this as Hydrangea 'Boitstein' for many years.) 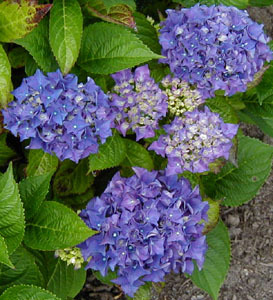 This gorgeous shrub outsells almost all the other blues. Up close, the individual flowers of Hydrangea 'Bottstein' (Haller, 1971) look pink with a purple wash. Stand back, and the overall appearance is violet deepening to a sumptuous royal blue. Medium-sized with robust large foliage. Good scarlet fall color.